Something a little different today... sensory play with shaving foam. I hadn't given shaving foam much thought until I came across two amazing ideas. The first was Instant Rain! Instant Fun! 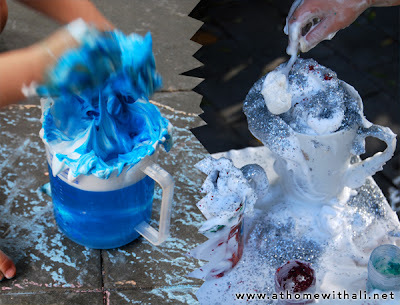 (scroll down a bit as this was part of a longer post) from Mrs Karen's Preschool Ideas – a simple experiment using water, food colouring and shaving foam. The second was Cappuccinos and Cakes in the Outdoor Kitchen from Pre-school Play – making coffees with brown water, shaving foam and glitter sprinkles. These two posts made me rush to the supermarket to buy some shaving foam. Below is our version of these two great activities. One hot afternoon we were on the patio watching the rain... a perfect time to make coloured rain in a jug. 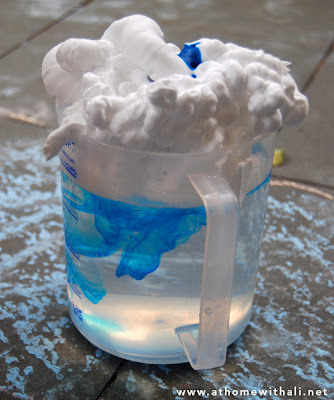 I filled our transparent jug with water and squirted shaving foam on top. Then I poured in some food colouring. The food colouring slowly made it's way through the foam and then seeped into the water – simulating rain from a cloud. This was pretty cool!! 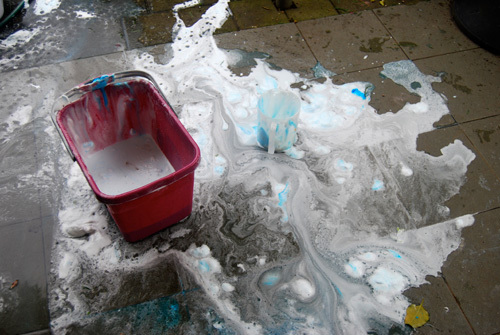 Once we had done this trick a few times, the girls played in water and shaving foam until the can was empty. ...and the end of play. Another day, another can of shaving foam put to use. I set up the outdoor table with cups, spoons, jugs of water mixed with dirt as 'coffee', glitter as 'chocolate sprinkles', a tub of flour as 'sugar' and a can of shaving foam as the 'milk froth'. The girls were busy making coffees for more than half an hour. Boo loved the flour tub and spoonful after spoonful of 'sugar' were stirred into the cups. Cakey got to use the can of shaving foam so she was a very busy little barista. And of course, these cappuccinos were the most sprinkly and glittery coffees that you have ever seen! For another fun shaving foam idea that we haven't got around to yet, check out Bathtub Painting from The Outlaw Mom. Note: During this activity I kept my eye on Boo to make sure she did not eat the shaving foam. Shaving foam looks delicious but isn't. 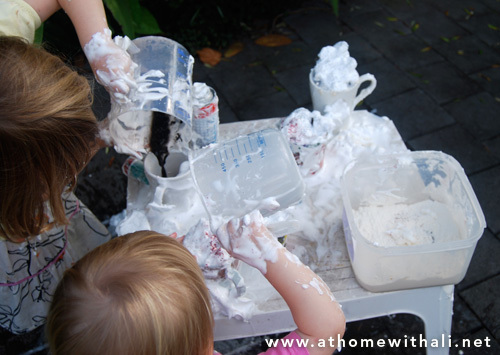 I love the shaving foam rain experiment, and can't wait to do it with my little ones. It looks like you had a lot of fun finally giving shaving foam a try. Thanks so much for sharing with Tuesday Tots! I love these ideas! 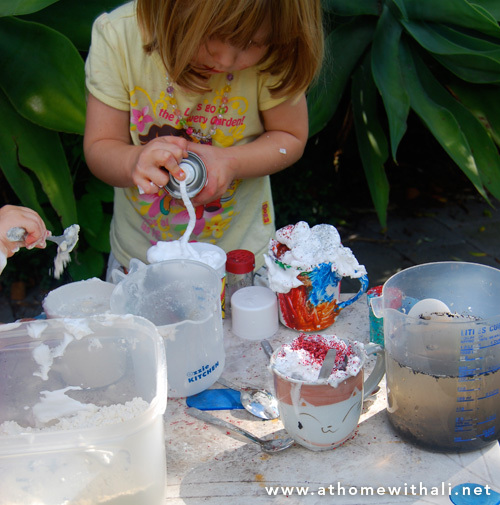 Can't wait until it's warmer outside so we can take this messy play out on the deck. Or, I guess we could keep it confined to the bath :-) Thanks for sharing our Bathtub Painting activity! Shaving cream is our number one fav sensory element! Painting with it, marbling with it, and just squirting out the bottle!